Mississippi College, a Christian university, located in the Historic Downtown of Clinton, MS, is the perfect place to live your dream of studying in the USA and the Intensive English Program is the first step in realizing that dream! Students in the IEP enjoy 20 hours a week of excellent English language instruction, focusing on building their reading, listening, writing, and speaking skills. You can complete each of our five levels in just 8-weeks and successful completion of our highest level gives you admission to a graduate or undergraduate program at Mississippi College. Mississippi College is ranked as one of the top private colleges in the southeast by US News and World Report and as one of the "Top 25 Best College Buys" by Forbes Magazine. For more information on how to begin your journey, contact us today! 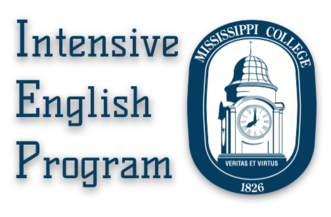 Mississippi College's Intensive English Program offers beginning students the perfect foundation in General English to build their future English language success. Our Level 1 and Level 2 course takes students with very limited English language skills and in just 8 weeks per level, prepare them to thrive in an English speaking environment. Our classes are small and personal. Our experienced instructors know how to make learning fun! For our more advanced students seeking university admission, we offer Level 3, Level 4, Level 5, and Level 5+ courses to prepare students for the demands of academic study in an English-only environment. These course build students' writing skills from basic paragraph construction to the five-paragraph academic essay all the way to a full research paper. Students also engage in advanced note-taking and oral presentation activities, build their academic vocabulary using the latest in language teaching technology and methods, and improve their academic reading skills. Our graduates leave our IEP with the skills and confidence to excel in any university setting. The Link Program at Mississippi College offers students the opportunity to continue developing their English language skills while also taking a limited number of academic courses simultaneously. This program is available to students who have demonstrated that their English language skills are at an advanced level but are still in need of more support in their first semester of study. The Link Program consists of two, credit-bearing courses designed to target the specific skills needed to be successful in an American university. For students with limited time or just looking for a quick course to improve their English between work or study, we offer several options for English language learning in the summer. We offer our full course offering of 8-week courses as well as special, shorter summer schools for interested groups. If you are looking for a great little university with a lot of opportunities for community engagement, contact us to find out more about what's going on in our IEP this summer! A great college and helpful for the international students. Teachers are glad to help me! IEP teachers are glad to help me. The best place for who need to improve English skills in Mississippi area. The best place for who need to improve English skills in Jackson area.